Can traps are a useful, inexpensive, and rapid method for assessing communities of macroarthropods. Pitfall traps (Fig. 9.4) have limited usefulness for assessing population sizes (Coleman et al., 1999), because catches reflect both density and mobility of arthropods. Still, pitfall traps are a valuable method for comparing habitats, assessing seasonal shifts in macroarthropod communities, and evaluating species richness. Species-area curves constructed from a series of trappings (Fig. 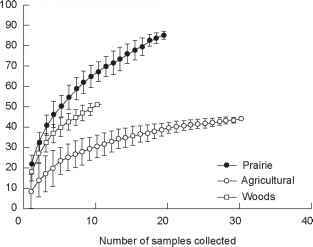 9.5) revealed the difference in species richness of a ground beetle community in Iowa (Larsen et al., 2003). FIGURE 9.4. Double cylinder for the capture of epigeic fauna: (a) outer cylinder, permanently set in the soil, (b) funnel, (c) removable inner jar with collection/preserving fluid (from Gorny and Gram, 1993). FIGURE 9.5. Species accumulation curves for ground beetles in tallgrass prairie, agricultural, and woodland habitats in northeastern Iowa based on annual pitfall trap samples collected over 5 years from each site and habitat (from Larsen et al., 2003). Pitfall traps consist of cans or jars, 5-25 mm in diameter, set flush with the soil surface. Arthropods blundering into the traps are directed by a funnel into a vial with preservative (Fig. 9.4). Alcohol and propylene glycol have been used as preservatives (Larsen et al., 2003). 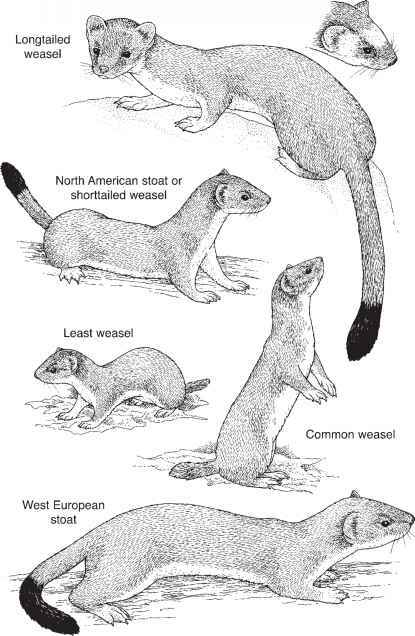 Propylene glycol is not subject to evaporative loss, but is poisonous to vertebrates and thus not recommended. If specimens are to be used for chemical analyses, a dry killing agent such as naphthalene or para-dichlorobenzene may be substituted. Pitfall traps should be emptied daily. Heavy rain may ruin the samples. Raised covers may be used to protect the pitfall traps and offer some protection from flooding by rainfall.